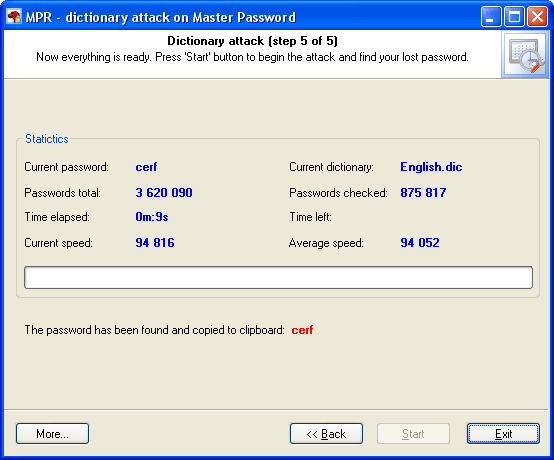 The last step of the password recovery wizard launches the attack you have selected and gathers and displays its statistics. If the option 'Check frequently used passwords before each attack' is selected, the program will attempt to find the password among the most frequently used words and phrases. That normally takes less than a minute. Later, if the password you were looking for is found, the program will notify you of that with the alert you have specified and copy the password to clipboard. At this moment, the Mozilla's (SeaMonkey's, Firefox's, or Thunderbird's) Master Password search speed is approximately 300 000 passwords/sec on a modern computer. Probably we will improve the decryption speed in the nearest future. P.S. It is recommended to adjust visual effects for best performance under Windows Vista.